Just 'fixed' Worm Seeker as well. He's actually using his normal damage table, but since I added the damage table switch it was making it last longer than normal. It still kinda lasts long for X, but the Z-Saber damage has been heavily increased on it so it'll die fairly quick. Either way, the damage table acts like it 'should' now. Hey justin3009, I suppose you're ready to wrap this one out and move on to other projects. And the hack looks perfect as it is (you've already gone way beyond everyone's expectations!). I just need to ask, just in case: have you considered adding the FMV from the PS1 version as a MSU-1 hack? I know there are MSU-1 hacks available for the music that are compatible with your hack (with the previous version, at least). I just haven't seen any mention of the FMVs. I have no interesting in doing anything with MSU-1 for this project (Except that it 'should' be compatible with the regular MMX3 MSU-1 patch). I'll leave that for other people to handle. That’s cool. By keeping it compatible you’re already doing a lot. Again, thanks for you hard work on this, and good luck ironing out the few remaining details! I reported the game's emulation issues on the Bizhawk tracker. Hopefully they can figure out why the romhack doesn't work on that emulator. These days, I don't want to use SNES9x because the controls don't properly play with the XB1 controller triggers: The jump and dash buttons are configured to use them, but SNES9x causes a hard cancel when trying to do a maneuver. Can't jump nor dash when both triggers are pressed. Whereas, Bizhawk allows me to dash and then jump without releasing the dash button. Hi justin3009, I know this is out of no where but I also try out the 4.0 beta the one posted out on 7th May 2018. If you clear the game as normal X, you start the NG+ as Zero. If you clear the game as Zero, you start the NG+ as normal X and you also manage to keep a buggy Hyper C.
3) Sometimes after switching your character, the 1st door leads to sub-boss/boss cannot be enter. You have to move the character away until the door is unseen then move back to the door to re-enter it. 4) Sometimes if you use normal X in 1st Doppler fortress, during/after the sub-boss, normal X will gain some armor parts. 5) Finally, the sub-boss in Neon Tiger stage cannot be easily taken down with X's buster/Z-saber. Is that normal? https://www17.zippyshare.com/d/Yv9mxu6s/5708/MMX3V4.0Beta.zip - Another beta test, hopefully the last that knocks out the bugs. All the bugs listed, except for possibly the Doppler Fortress one, I honestly can't seem to recreate that whatsoever nor is there anything that I can see, as of right now anyway, that would alter X's armor values. That's exceptionally odd. As for all the other ones, those 'should' be fixed now along with issue with sub-weapon ammo usage. The sub-boss in Neon Tiger's stage, I kept the Damage Table Switch code I had for it, but I altered the damage tables so anything can basically repeatedly hit it like the original game, so the boss should be a cake walk again. Okay, bug fixing a few things while I have a little motivation on this project again. There's been a common but exceedingly rare bug in which doors will not open in the Doppler Levels for some reason. I'm.. still not sure what would cause this. The only time these bits are set are during REX2000 and Mosquitus events. Otherwise, it's the Sigma Virus event. Essentially what happens is that $7E:1F5F gets set > 00. If it's above 00, it will not allow mid-boss doors to be opened. But this doesn't make any sense that it just.. suddenly happens sometimes when you switch. I'm looking into it even as I type but I'm not seeing anything that could cause this. This is very unusual. The only other cause I can think of is that it's underrolling the Object Animation setting which is at $7E:1F28. I rewrote the code just now, slightly, so it does STZ instead of DEC. Otherwise, if this bug occurs again, then I'm not sure what to say. None of my ASM files ever touch these two values in quantity. Anytime they are touched now, it STZs them. So let's hope it's fixed. I also thought maybe it was reading the 1-Up object on accident as the door value but that's not even close to the case either. It's reading entirely separate RAM. In any case, let's hope this is fixed. DO NOT USE A SAVE STATE IN WHICH THE DOOR IS CURRENTLY NOT WORKING! THIS WILL 'NOT' FIX SOMETHING ALREADY DONE! 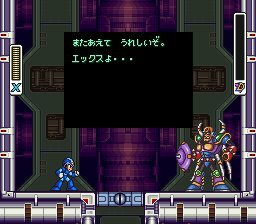 As for X suddenly losing armor parts, this is something I'm going to have to say may be outside influence with cheats or something else. I've had only a few reports on this but they're in circumstances that make absolutely no sense. The fun thing here is that there is no relevant code in any situation that would update the armor location, ESPECIALLY the NEW location that all PC RAM is stored to. The 'only' time it ever updates is if you obtain a capsule piece. There's nothing in any specific event to touch it, nor in the original code as it never existed in the first place. I won't rule out that it may be some latent code in the ROM somewhere but the fact that it's 'never' been seen after various damaging, moving, buster, specific and all other events is odd. Even in the new RAM data, there's 10 bytes prior that don't get read or touched making it more plausible that it's cheats or something. I still won't rule out an in-game bug but with how this is right now, I honestly can't chalk it up as a bug. It doesn't make any logical sense in any of the code for it to happen as it never gets touched in actual game play. https://www19.zippyshare.com/d/uoGJa7FE/859/MMX3V4.0Beta.zip - Here's the next beta test. This 'should' hopefully fix the door issue and the NG+ issues along with P.Bomb and T.Fang charge. That SHOULD'VE been fixed in the prior patch but hopefully this confirms it officially. The mid-boss in Neon Tiger's level should be a lot easier as well. It takes the full damage it should now and then some I think on X's buster too since there's been a common complaint of it taking too long. 1) Why neon jump has been removed? 2) Some glitches from original X3 doesnt work at this hack rom, for example the Crawfish's Quick Kill. This was removed intentionally? Why? 3) Why Zero cant use Hyper Charge? 5) Why some mini bosses now have extended iframes like the mini boss from Rhino's stage? 6) Why Zero cant charge weapons? 7) Is really a good idea Zero start with Air Dash and Double Jump at first? Im sorry if some of these questions have non sense now because i played and tested one of the released beta test versions, but im not sure if was the lasted version. a) Zero can charge weapons only after get the buster upgrade. b) Keep Zero air dash and double jump only after get boots upgrade. c) Make Zero hitbox the same as X hitbox. The huge Zero hitbox sometimes disturbs alot the gameplay for who is used to play with X.
d) Increase Zero mobility when hes shooting or using his Z-Saber. e) Fix the original X3 input problem that happens always when you try to make a jump in the exact frame when the player touch the floor, also knowed as glue bug. 1. Might've been accidental when I was tweaking animations and such. I haven't really touched the jump mechanics or anything so I'm surprised it's gone. It's probably harder to trigger if it exists still. 2. This was a massive bug and needed to go in the first place. Triad Thunder was slightly bugged on SFX and performance as well so I had to recode it slightly so it didn't break music instruments or insta-kill Crush Crawfish. Though, now the lightning balls that come out of X when he ground pounds also do significant damage to him to compensate. It's not the same, but it's not utterly useless either. 3. Been a feature I've been wanting to add since day 1. Zero is already overpowered as is, he doesn't need this. 4. This was an awful bug and needed to go. This was a glitch on my part when trying to fix the 'lemon' glitch and also with the new damage tables. There is absolutely no questioning on this one. This was an absolute bug and should not have existed in the first place. 6. This has been a feature I wanted to add since day one. Zero is 'too' similar to X in many accounts and I don't have the patience to recode how Zero entirely works. So he has to lose some features to compensate. 7. In my eyes, yes. Zero is clearly more powerful than X on all accounts even in the early game. X, however, becomes even stronger than Zero like he should when he obtains all his armor parts. He deals more damage overall than Zero when this occurs, especially with the Golden Armor, he's pretty OP at that point. A. This was asked before and I was going to add it, but decided not too. Zero doesn't 'need' to charge any sub-weapons. It's pointless since almost any attack he does breaks needed objects to get upgrades, does appropriate damage and sometimes even more than the charged sub-weapons. C. Nope. 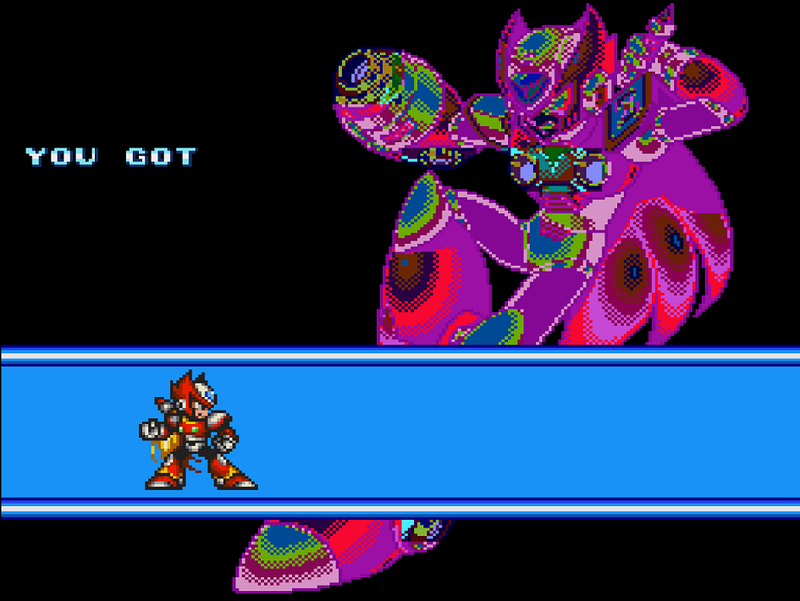 Zero is visibly larger than X. I did mess with his hitbox a couple times and it actually caused numerous bugs. I won't be changing this. D. That's way harder than it sounds. I was going to add mobility for X/Zero when it came to the Z-Saber so you wouldn't fall on ladders, walls, etc.. but that's just too much to deal with at this point. As for more mobile when he's shooting, I don't understand. If you mean remove the 'double fire' sequence then no. Zero's already strong enough as is and doing this would make him way too useful compared to X. Plus, I'd have to recode a huge slew of how the buster mechanics work and that's just not something I'm willing to do at this point. E. Never heard of this bug before, haven't heard any complaints about it really either. I can seem to jump just fine as well. It's also plausible that if it's in the exact frame, they never actually coded the player to jump on a specific part of the landing sequence. I think that was talked about right? Hope it's still in the cards. Great work turning this B- game into an A+ one btw! Hey just a question but would you consider changing Sigma's sprites to the ones from a prototype build that just got released this month? it's the August 9th 1995 build of the game. While some of the characters have totally different sprites that don't look all that good or don't really look like the official art, Sigma's August 9th design looks more like his art work and even looks more like he did in X1 and X2. His final design looks good, but it always felt off when you compare it to the other 2 games. Of course this is just a thought...but it would be pretty cool to see this sprite in the game. Here is a link from The Cutting Room Floor if anyone wants to see the August 9th design and the final design side by side or read more about the differences between the two designs. Wow that Sigma is just clearly better. Would love to see it incorporated in this mod. Yes, alot better. The head was just to small on the final version. Note: I'd be amazing if you could remove Zero's knockback as a upgrade similar to X's body armor upgrade (for the Black Armor, for instance). Wow, that Sigma looks great! I would love to see that implemented. What were they thinking when they made his head smaller? Did they think his head couldn't fit in the final boss armor? Anyway, it's about time I tried this patch. Have only played X3 once (more of an X2 fanboy) so I can't say much until I play it again! Thks for answering me and sorry for answer you just now. 1. No problem, if you can please add back the neon jump hability, its the essence of x2 and x3 games. 2. Ok, but i think should not care about some glitches that are hard to execute, they make the game more interesting. 3. Well, you could add Hyper Charge feature to zero only can use busters and not the saber, but no problem if still the same. 4. What a pity, i liked this glitch so much. As i said before, i think should not care about this glitch or another glitch that are hard to execute. 6. Well, if Zero is unable to charge weapons, some upgrades are harder or impossible to get as Zero, for example, the K module at Seahorse stage (possible to get only using Kangoroo when you use Zero only) or H module at Crawfish stage (possible to get only with X). 7. Well, ok, Zero can start with both air dash and double jump, but i suggest you to add the same hability to Zero make long jumps, the same you get when you get the Black Armor, but at Bufalo stage. For compensate, re-add the triple jump feature for Black Armor, i miss so much the hability to make tree jumps and it save alot time when you use it to skip the spike climb at Doppler II stage, otherwise i must switch to X and do that climb using the normal way used at 100% category of Mega Man X3 speedrun. A. As i explained at 6. B. Ok, anyway, i already suggested an alternative way at 7. C. What a pity too, but no problem, i can live with this, hehe. D. When i suggesting to increasing more mobility, i was refering for example when Zero is releasing shots with lv 3 or higher, it let him too slow and break his mobility. About the glue bug, you only notice about it when you become a speedrunner hehe. As reference, compare the x3 mobility with x2, x2 is a way faster and fluid, but there is a nice curiosity, in the Aug 9th, 1995 prototype version released at this month, the mobility is very fast and almost like x2. I suggest you to take a loot at this prototype version and compare its code with the final version. Trust me, Justin already took a look at this prototype. He even commented about that on the Mega Man X9 chat. http://www.romhacking.net/hacks/4086/ - Release version has been approved and is up! There's a couple big fixes that weren't in the beta tests and a new feature where pressing 'Start' during dialogue will essentially skip the whole event. Otherwise, as per usual, enjoy! If any bugs come up, just post 'em here or e-mail me and I'll put them on a list to fix when I can get to them. 1.) When playing the intro stage as Zero, X's animation to take down the...whatever that giant bug ship thing is, seems off. It looks like the sprites used were his Z Saber sprites with the Z Saber removed. Not sure if this was intentional or not. Again, thanks for all your hard work! I realize the first of those two points may be a bit nitpicky, but it didn't detract from my enjoyment of this hack one bit.